Living in Frisco, TX means you probably have a garage at your home. That garage has a door that needs some maintenance from time to time, and that is not something you should be worried about. 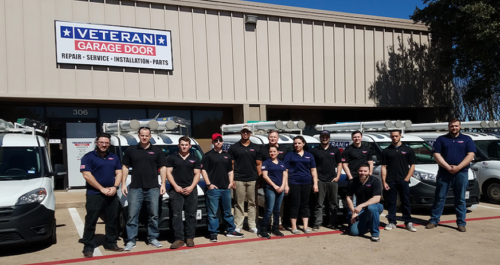 Your local garage door repair service provider, Veteran Garage Door, can take care of all of your garage door needs, quickly and professionally, and most importantly – with a smile. Veteran Garage Door provides expert service in Frisco TX. We have over 10 years of experience and we are a leading company in the garage door industry. We also have a very dedicated and professional team, that will be more than happy to help you with all your garage door needs. No matter what needs to be fixed or replaced, we have a variety of solutions for every problem. From a noisy garage door to a broken hinge replacement, we offer full service that will leave every customer in Frisco, TX satisfied. Our service includes free onsite estimates, a warranty on all parts, labor and installation, 24/7 availability and a quick, same day service. The garage is an important part of your home, and as such, everything in it should be completely functional. In case your garage door needs a sensor repair, or if it got off track or suffers from any other problem that might occur, we have a fleet of fully equipped service vehicles on the go. Whether it’s for commercial or residential use, we can fix it without making a hassle. We offer a wide range of services for our Frisco, TX customers. We can reprogram a remote or a keypad for your garage door, and we can also add in smartphone control. We believe that your garage door should always be functioning as ideally as it can, and part of that is making the entire thing simple and easy to use. In conclusion, Veteran Garage Door’s repair service is here for you any time and any day. We will provide the best service you can get anywhere in Frisco, TX. Try us – you won’t regret it!